Juicey strawberries ripening on our ‘table-top’ growing system. We have been growing soft fruit for sale on the farm for the past 30 years. Originally a small area of strawberries were grown as a sideline to the farming business. Now the soft fruit at Peaks Top Farm includes over 2 hectares of strawberries, a ‘table-top’ strawberry growing system, 5 poly-tunnels plus outdoor bush and cane fruit such as raspberries, black and redcurrants along with 3 varieties of gooseberries. New for 2016 we have planted a variety of blueberries called Juke. 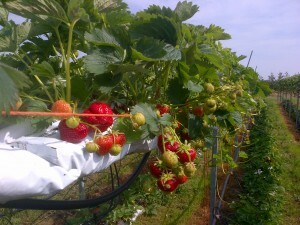 Our fruit season usually starts mid June until late July depending on the weather. Strawberries and gooseberries begin the season, with the raspberries, red and blackcurrants towards the end of June through July. We are open 7 days a week through the main season 10am – 5pm. We welcome all members of the public to come to the farm and ‘pick your own’ fruit. At a little extra cost we have a ready picked service for all our fruit if you don’t have the time to pick your own. Our blackberries come into fruit later in the year; generally around August. Once October arrives we move into our orchard to begin picking apples and plums. We grow 4 varieties of apples (Scrumptious, Russet and Falstaff eaters and Bramley cooking apples). The 2 varieties of plums are Victoria and Czar. Depending on yield we also aim to have rhubarb available in season. A proportion of the delicious fruit we grow on the farm goes straight to our winery. Here we make a range of fruit wines. These are available to buy directly from the farm or through our website in the shop. With our team of pickers we have the capacity to supply fresh, daily deliveries of our main seasonal fruit to the Grimsby and Cleethorpes area. Whether it is for commercial resale, restaurants, catering businesses or for special occasions please contact us to discuss your requirements.